I’m sure you have questions, have at it! Just yourself, music to break to and closed toe, flat shoes. We highly recommend you wear socks and boots or other thick soled shoes. We have full face shields, coveralls, gloves and shoe covers for your protection. 2. Can I bring my own weapons? We cannot allow you to bring your own weapons in due to our insurance requirements. 3. Can I bring my own breakables? Yes, you may bring in your own breakables to expand a session. Please limit this to glass, porcelain, computer towers, laptops or stone manufactured material. 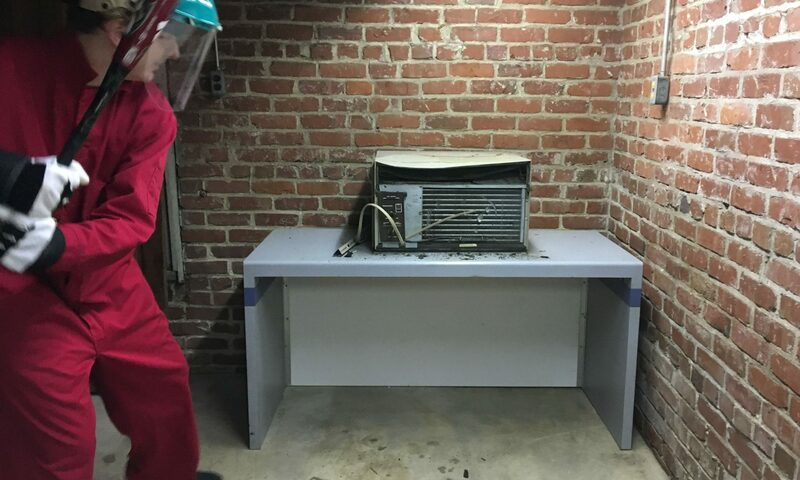 We do not allow destruction of televisions or other equipment which may contain hazardous material such as mercury. All items brought in will be hand-checked to ensure your safety. 4. What am I breaking? This depends on what we currently have in stock and which package you pick. Expect a variety of items including cars (after March 1), monitors, televisions, laptops, desktops, alarm clocks, printers, fax machines, and lots of porcelain or ceramic plates/glasses/mugs/bowls! 5. Do you accept donations? Yes, we are happy to pick up donated breakables. Please email us to schedule a pickup. Please be aware that we can not accept televisions or computer monitors. 6. How much time do I have? Each session is 5, 10, 15 or 25 minutes depending on the package chosen. It will also take 10 minutes or so to get set up with safety gear, sign waivers, and set up your music so please arrive 15 minutes early. We are unable to extend your time if you aren't set up on time. 7. Do you take health insurance? We are not set up to bill insurance companies but all of our sessions generate receipts which may be turned in for reimbursement. 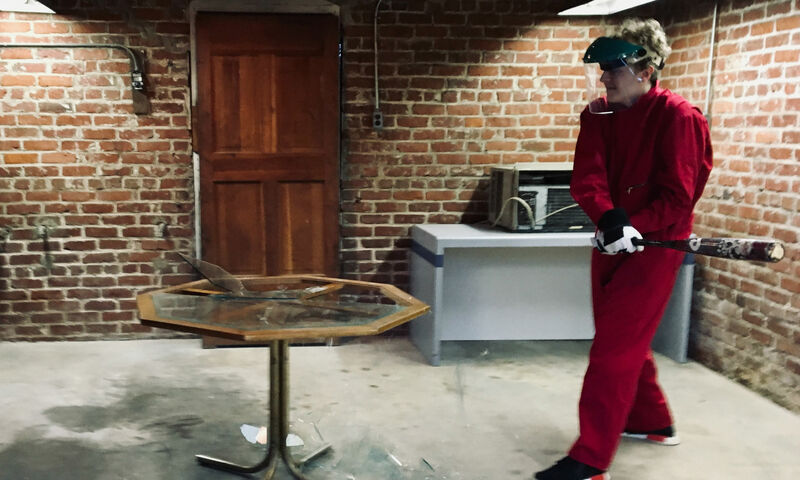 Use of a rage room is not an accepted medical therapy and we can't guarantee you'll see health benefits from purchasing a session with RageRVA. 8. Can I get pictures or video of my session? Yes, we have several options available for your review on-site. 9. Is there an age restriction? No one under the age of 18 can participate without the presence of their parent or legal guardian, and such parent/legal guardian are required to sign a waiver of liability for that person and be present in the room during the full session. Session participants must be at least 13 years of age. 10. Can I play music during my session? Yes! You can pair your phone directly to our system. In the event that you need to cancel your appointment, please be sure to give us a minimum of a 24-hour notice. This allows other guests to book an appointment during this time slot. Any appointments that are ‘no call no show’ will be subject to a cancellation fee of 100% of all the scheduled service(s). If you want to schedule a new appointment you'll need to purchase a new package. We understand that accidents happen, people get sick and/or emergencies occur. We will do our best to accommodate these rare occasions with clients as warranted. 12. Do you allow fire events in your rooms? Sorry, we encourage you to burn calories, not items! Drinking and sledgehammers are a bad combination. Please arrive sober and get high on the fun of smashing stuff! We are a short walk/ride away from some of Richmond's finest nightlife after your session. Participants under the influence of alcohol and/or drugs will not be allowed to begin a session. 14. Do you allow smoking or vaping during sessions? Rage RVA is a no smoking/vaping environment. You're going to need that lung power to make your session awesome anyway! 15. How many people can be smashing things at once? For safety purposes we have limits on how many people can be in a room at one time. Our Quickie is designed as a solo experience, other packages allow you to add guests.